The present study is aimed to investigate micro-milling performance of thermoplastics with different parameters, namely laser beam absorptivity, latent heat of vaporization, laser power and cutting speed. The 25-W CO2 (CW) laser engraving machine is used for the investigation. In total 50 different combinations of laser power and cutting speed with four categories of thermoplastics, namely poly-methyl-methacrylate, poly-propylene, acrylonitrile butadiene styrene and nylon 6, are used in this study. Experimental results suggest that laser beam absorptivity, cutting power and cutting speed are the major influencing parameters on depth of cut. Theoretical model for the prediction of depth of cut in terms of material properties, cutting power and cutting speed has been proposed. Two correction parameters have been introduced in this analysis using non-linear regression method to improve the theoretical model. Comparison has been made between prediction capabilities of theoretical model, model based on multi-gene genetic programming and artificial neural network. The comparison clearly indicates that all the three models provide accurate prediction of depth of cut. 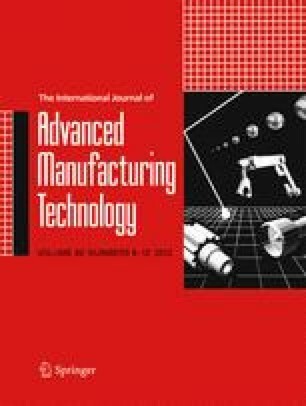 The details of experimentation, model development, testing and the performance comparison are presented in this paper.